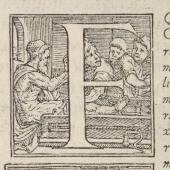 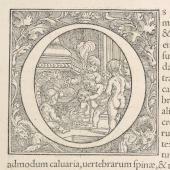 As with many printed books at the time, the Fabrica contained decorative initials. 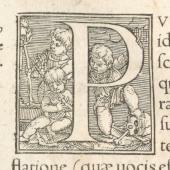 Each book was headed with a large initial, and chapters with smaller initials. 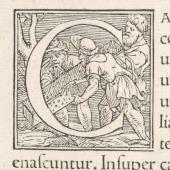 This was a convention that had also been used in manuscripts. 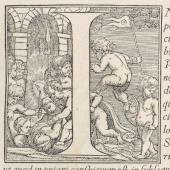 The initials of the Fabrica were tailor-made for the book, and show scenes relevant to the content of the book, such as grave-robbing, boiling bones in a cauldron, and articulating a skeleton. 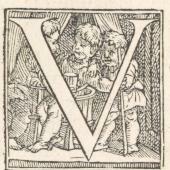 In some cases, such as for venesection or Dryander, even a pun may have been intended. 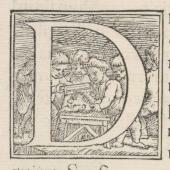 It is not clear whether these initials were made at Vesalius’s request or done by the printer Oporinus’s initiative, but it is another example of the level of design and care that had gone into creating a bespoke book on human anatomy.